Not being a fan of the amnesia as a plot device, I was disappointed from the get-go with this book. That and completely unrealistic situations (I think even fictional humans have to perform toliet duty, ok?) where an woman falls into a fugue state every year but isn't hospitalized is ludicrous. Then there were the abrupt segues into the 300 years gone past, the child, etc., it was too many things not too have remembered yet she functioned as a mom, wife and magic student - blehh! 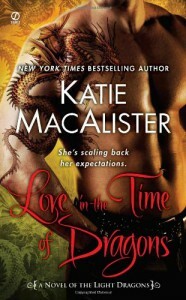 So, unless you're a die-hard fan of KM's dragon series I'd say skip this one and hope, like me, that she'll put out a better novel next time - more like the smart and funny Fired Up & You Slay Me.